Grace and peace with you from God the Father and the Lord Jesus Christ. 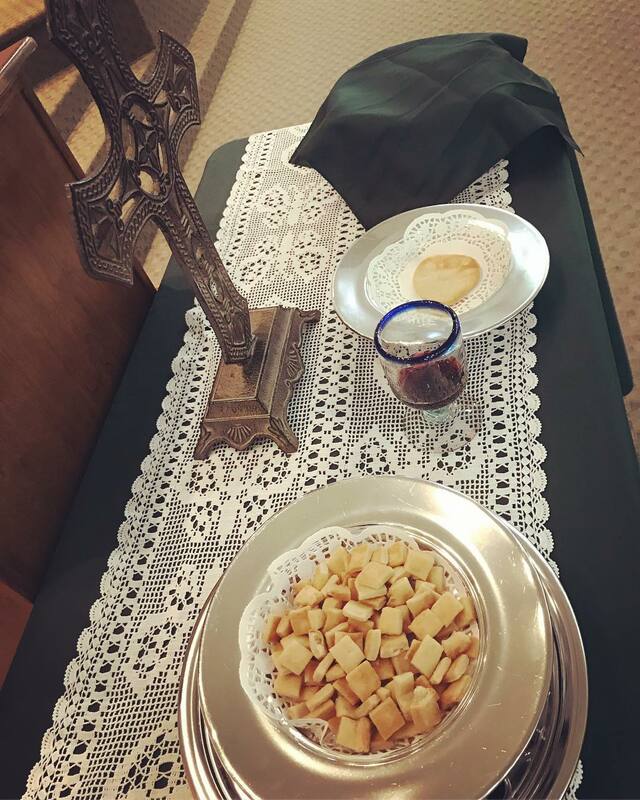 We looked at baptism two weeks ago; this week will look at the Lord’s Supper. Our sermon text is Luke 22:7-21. If you are able, please stand and listen to God’s Holy Word. Then came the day of Unleavened Bread, on which the Passover lamb had to be sacrificed. So Jesus sent Peter and John, saying, “Go and prepare the Passover for us, that we may eat it.” They said to him, “Where will you have us prepare it?” He said to them, “Behold, when you have entered the city, a man carrying a jar of water will meet you. Follow him into the house that he enters and tell the master of the house, ‘The Teacher says to you, Where is the guest room, where I may eat the Passover with my disciples?’ And he will show you a large upper room furnished; prepare it there.” And they went and found it just as he had told them, and they prepared the Passover. And when the hour came, he reclined at table, and the apostles with him. And he said to them, “I have earnestly desired to eat this Passover with you before I suffer. For I tell you I will not eat it until it is fulfilled in the kingdom of God.” And he took a cup, and when he had given thanks he said, “Take this, and divide it among yourselves. For I tell you that from now on I will not drink of the fruit of the vine until the kingdom of God comes.” And he took bread, and when he had given thanks, he broke it and gave it to them, saying, “This is my body, which is given for you. Do this in remembrance of me.” And likewise, the cup after they had eaten, saying, “This cup that is poured out for you is the new covenant in my blood. The word of the Lord. (Thanks be to God!) May God add his blessings to the reading, preaching, and hearing of his word. All the church says: Amen! You may be seated. In his wonderful book, A Meal with Jesus: Discovering Grace, Community, and Mission around the Table, Tim Chester poses a thought question for our consideration. One, “The Son of Man came not to be served but to serve, and to give his life as a ransom for many ” (Mark 10:45); Two, “The Son of Man came to seek and to save the lost” (Luke 19:10); Three, “The Son of Man has come eating and drinking . . . ” (Luke 7: 34). All three of these statements come together when we contemplate the meaning and purpose of tables in the Gospel of Luke. Jesus ate and drank with all kinds of people — outsiders and insiders, sinners and followers. He ate and drank so often that some critics even called him a glutton and a drunkard. But his eating and drinking had a missional and liturgical purpose. In Luke 5 where Jesus eats with tax collectors and sinners at the home of Levi. In Luke 7 where Jesus is anointed at the home of Simon the Pharisee during a meal. In Luke 9 where Jesus feeds the five thousand. In Luke 10 where Jesus eats in the home of Martha and Mary. In Luke 11 where Jesus condemns the Pharisees and teachers of the law at a meal. In Luke 14 where Jesus is at a meal when he urges people to invite the poor to their meals rather than their friends. In Luke 19 where Jesus invites himself to dinner with Zacchaeus. In Luke 22 where Jesus establishes and institutes the Lord’s Supper. The festive spirit of Jubilee comes out in all this feasting and fellowship around tables. Again, notice the missional and liturgical rhyme and reason for all this. All the little tables are missional. The big Table is liturgical. The ordinary tables are missional. The extraordinary table is liturgical. A careful reading of Luke reveals that Jesus treated all meals as if they were “sacramental” — as if they were little signs of grace that pointed to the big sign of the grace in the eucharist. Why? Ordinary tables were extensions of the extraordinary table of the Lord. They help bridge the gap between the lost world and the Lord’s table. They are signposts that help people find the Savior. They are stepping stones to the eucharist. Tables are places where some of the most important things happen. Tables are where you eat and drink and share life. Tables are where you read mail, sign contracts, and plead with loved ones. Tables are where you drink coffee and play games. Tables are places where you sit and wait and think. But we’re gathered here today to eat and drink at the Lord’s Table. This is the Table where Christ established and instituted his Supper as the New Covenant Meal. Think about all that Jesus and the disciples have been through up to this point. All the walking and talking and debating. Especially the past few weeks and days! The Passover arrives and they finally have a chance to get away and sit down and enjoy a meal together. Unlike ordinary meals which contain a variety of entrees and sides and portion sizes, this extraordinary meal contains bread and wine — a bite of bread and a sip of wine. What makes this meal extraordinary is not the bread and wine, but the words of the Lord Jesus Christ which set the bread and wine apart for holy purposes. This is the Lord’s Supper. He is the Gracious Host who invites us to his Table to eat this holy bread which he calls his body and to drink holy wine which he calls his blood. This extraordinary meal contains bread and wine — but that is not all. It also contains word and Spirit which teach us that bread and wine are the body and blood of Jesus Christ. Today is Reformation Sunday. We often celebrate Martin Luther’s act of nailing the 95 These on the door at Wittenberg — that act that sparked the Protestant Reformation. But today we must lament the fact that ever since the Reformation, Christians have differed and divided over the meaning and mode of the Lord’s supper. The covenant meal that should unite us divides us. In some ways, this is understandable. The Lord’s Supper is profoundly mysterious. But about 1200 years after Christ instituted the Supper, the mysterious gave way to the superstitious. The cup was taken away from the whole Church. And all children were kept away from the bread. The fear was that since the bread and wine changed into the body and blood of Jesus, some people (especially little children) would drop the body of Christ, or spill the blood of Christ on the floor, and it would be desecrated — and those dropped or spilled would be guilt of taking in an unworthy manner and susceptible to judgement. As some of you learned in Bible Class today, ever since the 1200s, Romans Catholics believe that the essence of the bread and wine change into flesh and blood of Jesus Christ. They call this transubstantiation. This is the superstitious view that pushed aside the mysterious view in the 1200’s AD. They believe in the real Presence of Christ in communion — in the bread and wine. In the 1500s, the Reformers tried to correct this error. Ever since, Lutherans believe that Christ is present with the bread and wine, but the elements do not change. They call this sacramental union or consubstantiation. They believe in the real Presence of Christ in communion with the bread and wine. Reformed and Presbyterians (Calvinists) believe that the bread and wine are signs and seals of God’s grace to us. They believe that Christ is Present with us in the Lord’s Supper by his Spirit. We call this the mystical presence of Christ. We agree with Calvin and the Reformed and Presbyterian view of the mystical presence of Christ in the Lord’s Supper. and they that worthily commune feed upon his body and blood [by faith in Christ], to their spiritual nourishment and growth in grace; have their union and communion with Christ confirmed; they testify and renew their thankfulness, and engagement to God, and their mutual love and fellowship each with other, as members of the same mystical body. When we partake of the bread and wine by faith, we are really and truly participating in, communing with the broken body and shed blood of Christ in the Spirit. Not because the bread and wine are changed, but because when we eat and drink the body and blood of Christ by faith, we are changed by the Spirit of Christ who unites us to Christ and to one another in Christ. We believe that when we take the bread and cup in our hands, God will remember who Jesus is and what Jesus has done for us; God will remember the covenant of grace which he made with us in Christ. We believe that when we take the bread and cup in our hands we are doing much more than remembering Jesus. We take the signs and seals of his covenant to remind God that the body of Christ was broken for me and the blood of Jesus was shed for me. We believe that when God sees his signs and seals — water, bread, and wine — he remembers his covenant with us and renews it for us. Several of you have been asking some really good and important questions along these lines about your own children and communion. I would be happy to talk about these things in more around a table with you, so feel free to hit me up any time. Suffice it to say for now, that when it comes to the Lord’s Table and Supper, Christ is for you and for your children. He is not against you or you children. As with many things in our life and faith, there is an already/not yet aspect to keep in mind. For example, in the OT reading before the sermon, we heard how God called the head of the household to select and slaughter a lamb according to the number of mouths for his family. Those who were able to eat solid food were given solid food to eat. Those who were not (yet) able to eat solid food were not given solid food nor expected to it. Still, every member of the household received the benefits of the slaughtered lamb, shed blood, and broken body of the lamb. The same holds true for your and your children today. Even your baptized children who do not yet take communion reap the benefits of Christ by virtue of his grace and your faithful obedience to Christ. We also heard that as children grow up in the Lord and in the faith they start asking their parents questions: Why do you do X? What it mean to you? That shows us that partaking of the Passover meal was something that covenant children grew into. The same holds true for the Lord’s Supper. When your children start asking you questions about the things of God, that’s a good sign that either they are coming to faith or they have already come to faith. As we heard in the OT reading, parents are expected to catechize their children, to tell them what X means according to the word of God. This kind of catechesis helps your children grow up in the Lord and prepares them for cross-bearing and communion. Now, as you and your children grow in the grace and knowledge of Jesus, we encourage you to involve your pastors and elders in the conversation. We can help you walk through these things — and when the time comes we can welcome your baptized and believing children to the Table to commune with Christ and the church. Others of you have been asking some really good and important questions about yourself. You want to know if and when you can come to the Lord’s table and partake. If you have not yet been baptized with water in the Triune Name of God, you may not yet come to the Table. This covenant meal is for people who bear the sign and seal of God’s covenant on their life. If you do not yet believe Jesus is your Lord and Savior, you may not come to the Table. This covenant meal is for people who believe the gospel of Jesus Christ. If you were baptized with water in the Triune Name of God in a different kind of church from ours — whether Roman Catholic, Baptist, Methodist, Church of Christ, et al — and you have turned from your sins and trusted in Jesus, you may partake of this Supper. If you are not yet a member of a Christian church, we urge you to commit yourself to a local church as soon as possible. We would love to see you come under our care, but whether you become a member here or somewhere else, commit yourself to a congregation of God’s people. If you are a baptized believer, the Lord’s supper is for you. But, if you have sins that you have not confessed to the Lord, or sins that you have not repented of, you should do so now, before you come to partake of the Supper, or else you will eat and drink judgment on yourself. If you refuse to repent and insist on keeping your sins, the Lord’s Supper is not for you. If you are a baptized Christian who has doubts and fears about your standing with the Lord, if you feel unworthy to come to the Table, we urge you to come eat and drink, trusting that God makes promises to love you and take care of you in Christ. As the Larger Catechism says, “this sacrament is appointed for the relief even of weak and doubting Christians.” (LC Q172). Every Lord’s day, this table is set with bread and wine according to the word of the Lord. The Lord’s Supper is for you. It is for many already; not yet for others.